The Delfin II • Use the form below to contact us directly. Fill in the fields to check availability & reserve direct with The Delfin II. Thank you. We will get back you with regards your adventure booking within 24 hours. 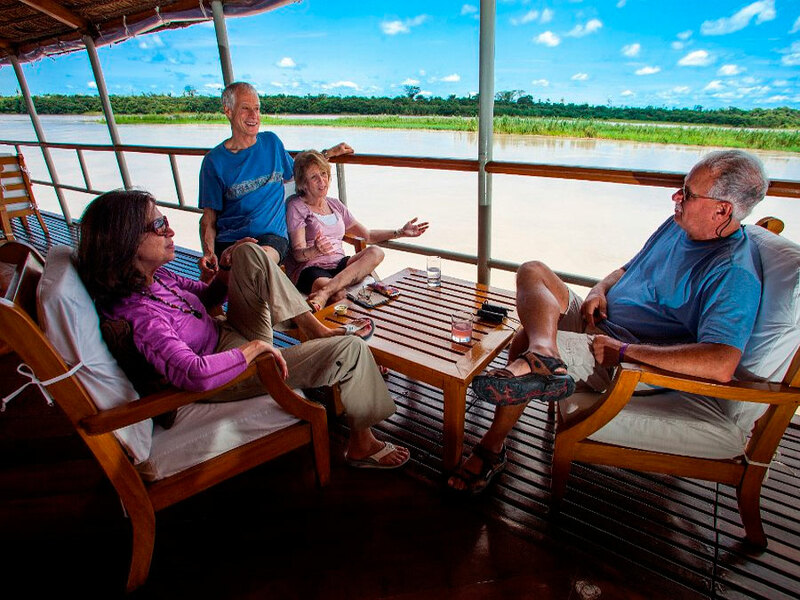 The Delfin II Luxury Amazon Cruise begins near Iquitos from the small town of Nauta. 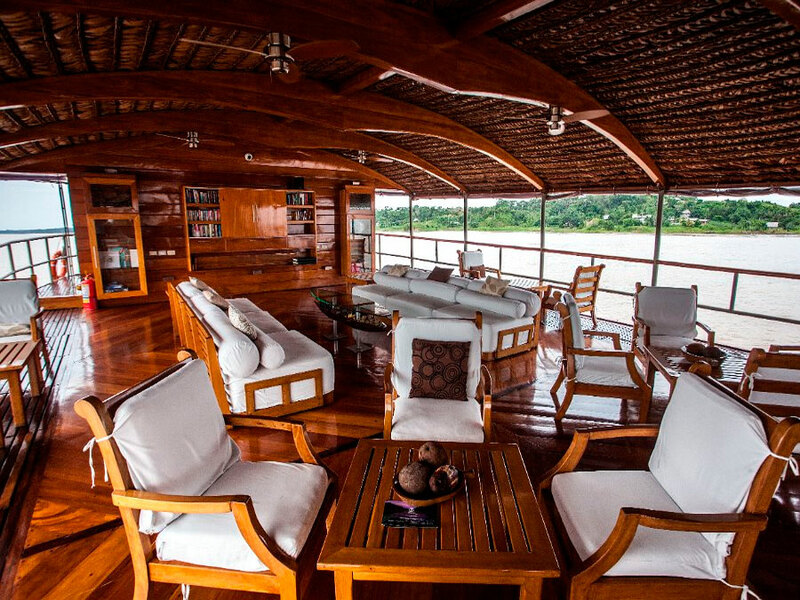 You will be transported in our comfortable coach from Iquitos airport to the dock of the luxury Delfin II riverboat, and after a cocktail you will board our comfortable vessel. 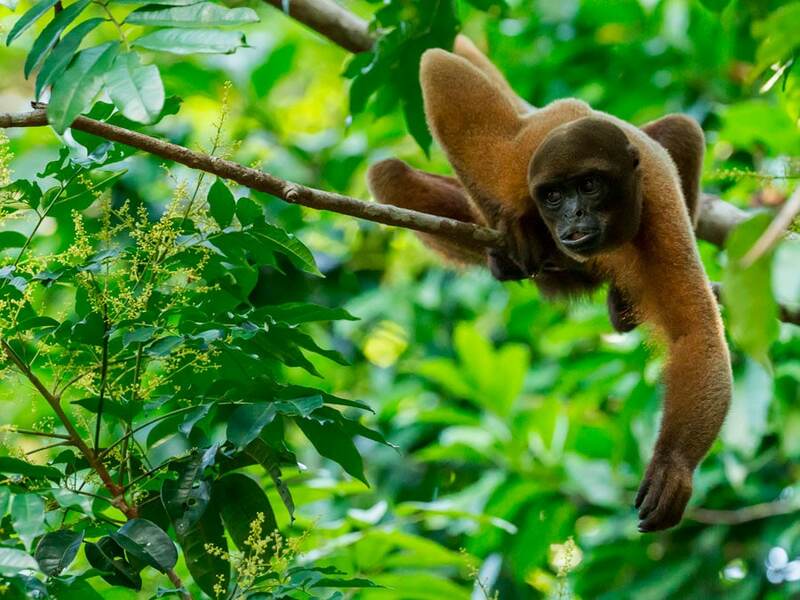 We will now voyage into the Pacaya Samiria National Reserve to experience a combination of cultural history, natural wonders and some of the highest levels of animal and plant life in the Amazon Rainforest. 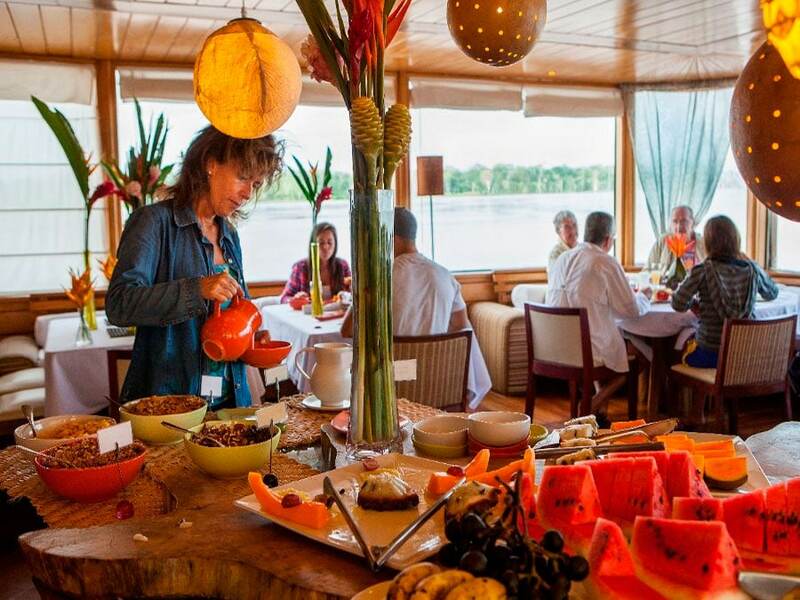 The food is terrific, the staff is wonderful and the excursions are great. Massage was excellent. The Delfin objective is to offer you an experience second to none from the moment we pick you up in Iquitos to when we drop you back. 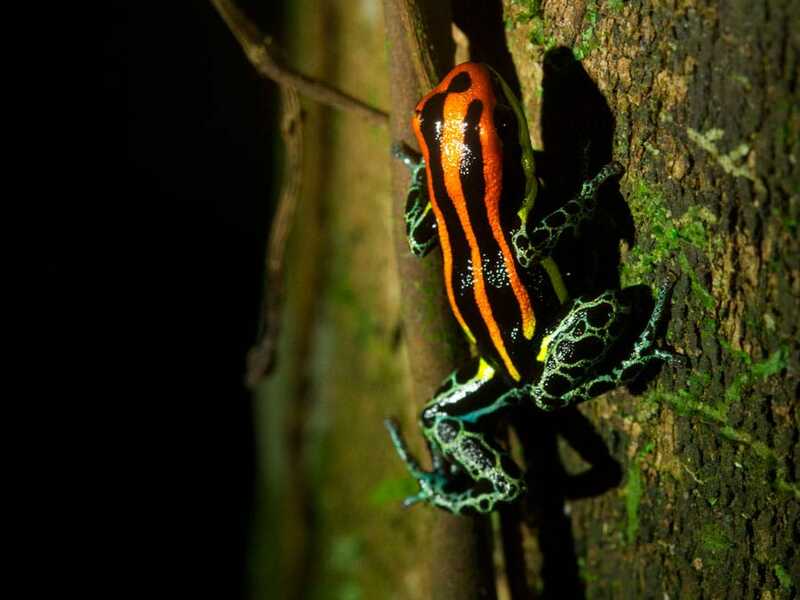 We will visit remote locations in comfort, relax on cruise or explore the forest with professional naturalist guides. While cruising pristine rainforest surroundings, you can take advantage of our wellness program with a massage on cruise after a forest expedition. 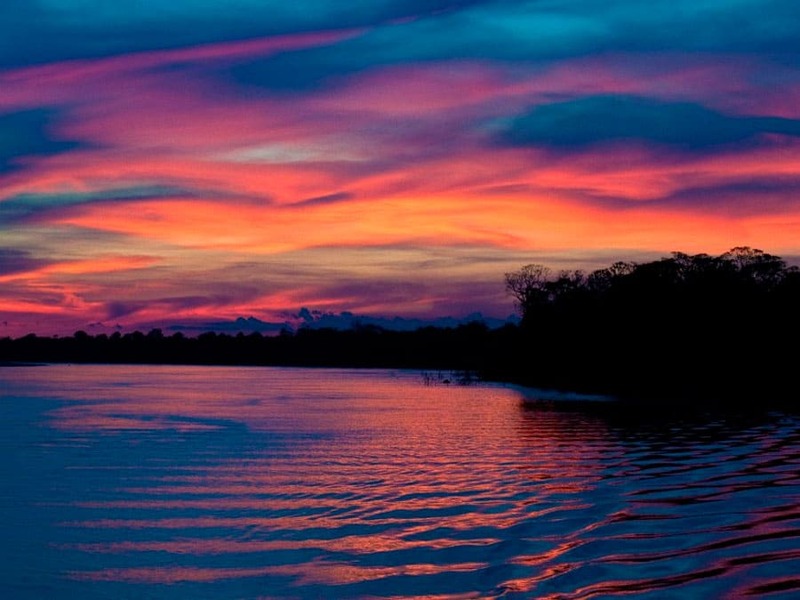 Iquitos is the main Peruvian gateway to the Amazon Rainforest and is the largest city in the Peruvian Amazon. 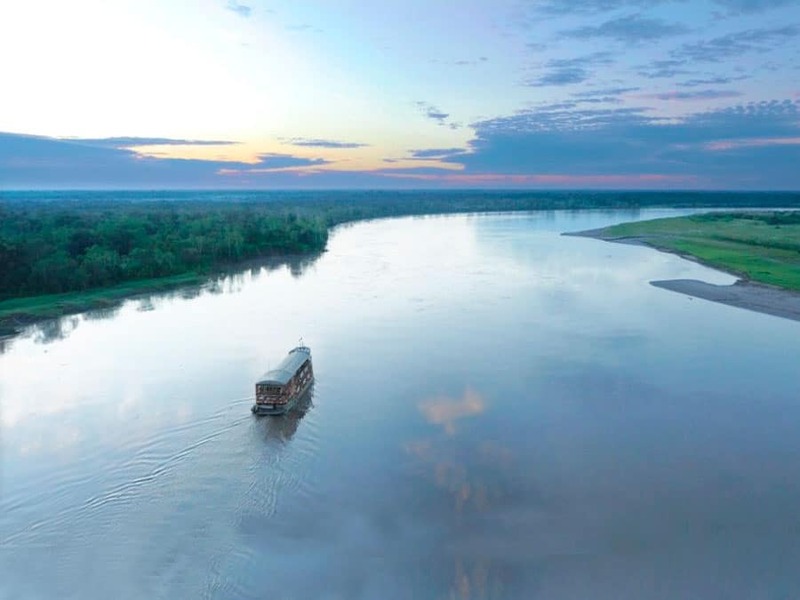 There are no roads that connect Iquitos to the rest of Peru making it the largest city in the world unreachable by car. Because it is a port city of the Amazon River, you can get to Iquitos by boat, but the most popular way to enter and leave Iquitos is by plane. 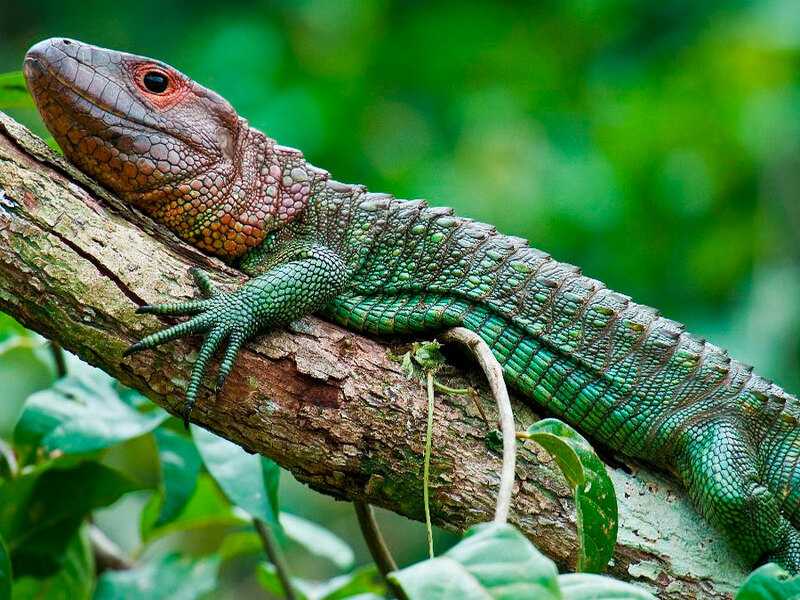 From Iquitos, you can visit incredible protected areas that contain some of the highest diversities of life on Earth. 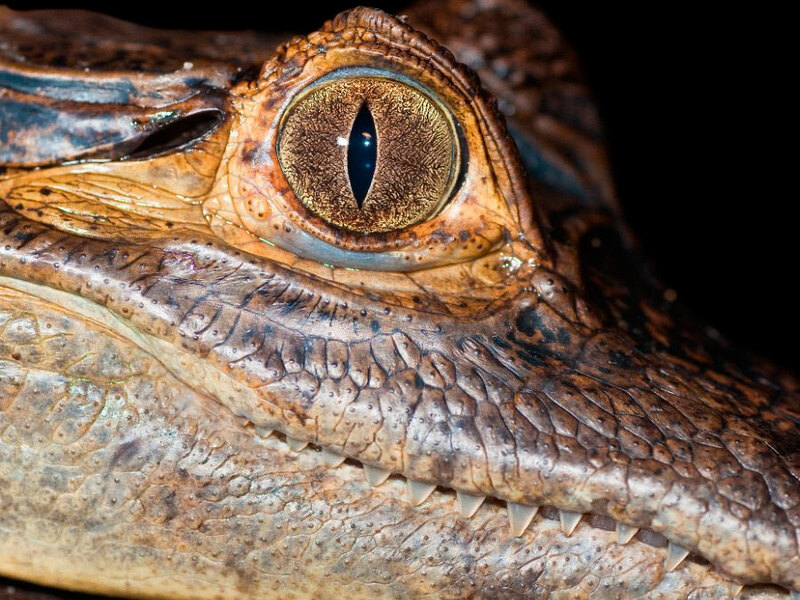 The Pacaya is a flooded tropical forest of the Iquitos Amazon and provides guests with fantastic bird watching opportunities and chances to see other wildlife, such as Monkeys and aquatic life of caiman, turtles, and the largest fish in the Amazon River, the impressive Arapaima. 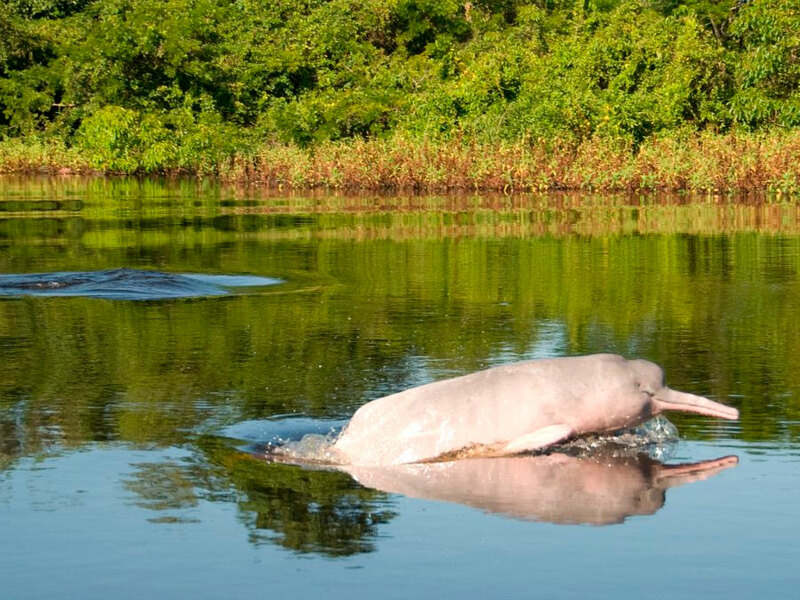 The Pacaya Samiria National Reserve has a conservation initiative with local people to preserve the Arapaima in Lake El Dorado. 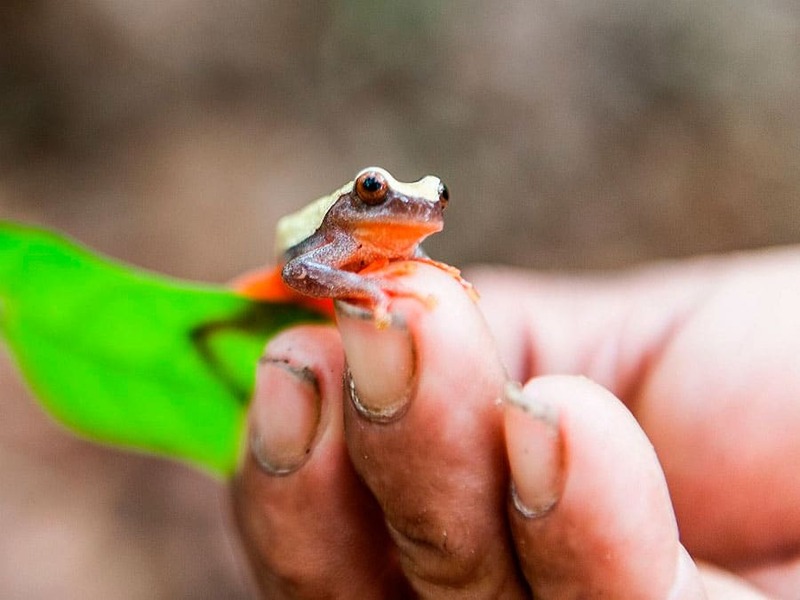 The Tamshiyacu Tahuayo Reserve is an area of protected forest not as well known as the Pacaya Samiria National Reserve, but it contains a high number and diversity of Amazon animals and plants. 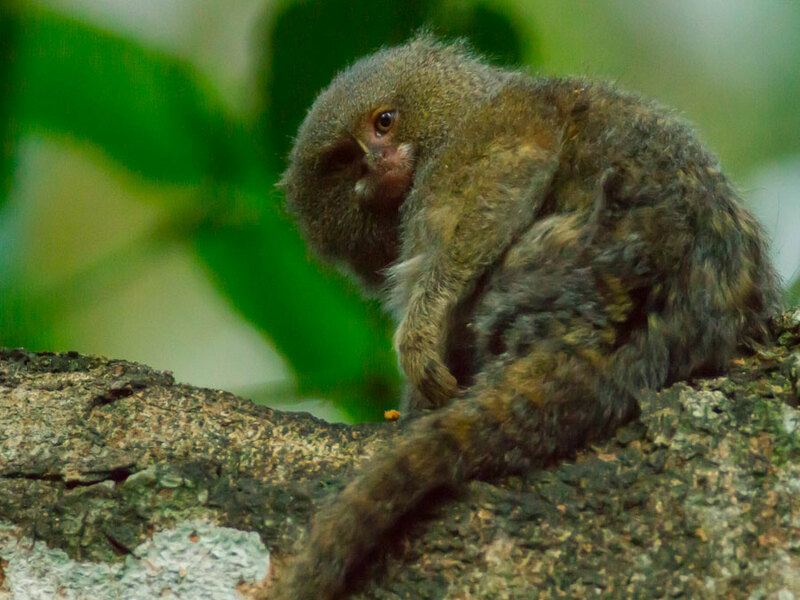 The reserve was established primarily to protect the rare Uakari Monkey and is now a haven for several different monkeys that can often be seen with relative ease inside the reserve. 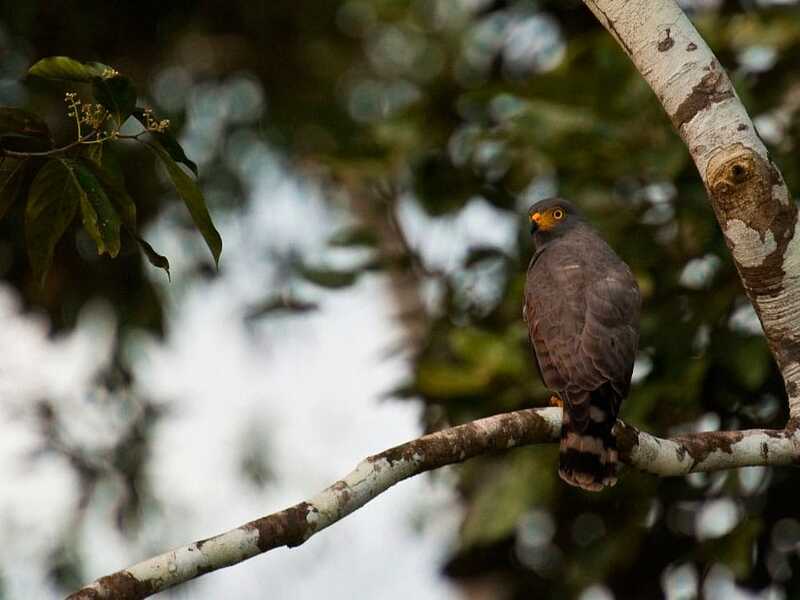 The reserve is also home to a great diversity of animals including Jaguar, Tapir, Anaconda, Paca, Brocket Deer, and many different tropical birds. Like other rubber boom cities, such as the larger Manaus in Brazil, some of the architecture in Iquitos reflects the power and wealth of the rubber boom period. The Iron House for example, which is near the Plaza de Armas, was initially seen in Paris, France, by a rubber baron. He decided he liked the building and so shipped it in pieces to Iquitos in the middle of the Amazon Rainforest. Guest reviews are written by our customers after their voyage on The Delfin II. 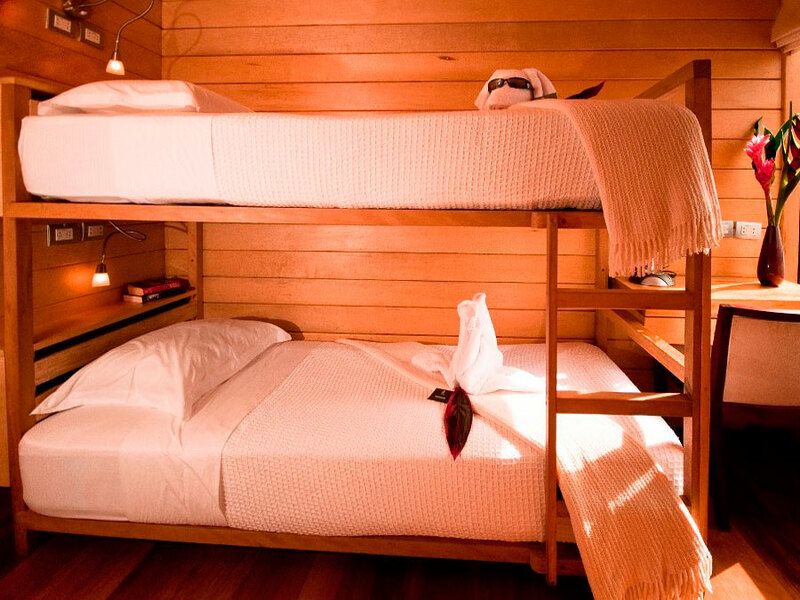 Very comfortable accommodation, excellent food, incredible wildlife of the Pacaya Samiria Reserve and high quality service. The Delfin II includes 14 large guest suites composed of four master suites with 180 degree panoramic windows and ten comfortable suites. Four of these can be connected to accommodate families. The Delfin II provides comfortable and elegant world-class accommodation. The other rooms consist of a dining room, entertainment center, observation deck, small massage room, exercise room, bar, library, and our special hammock sun deck. 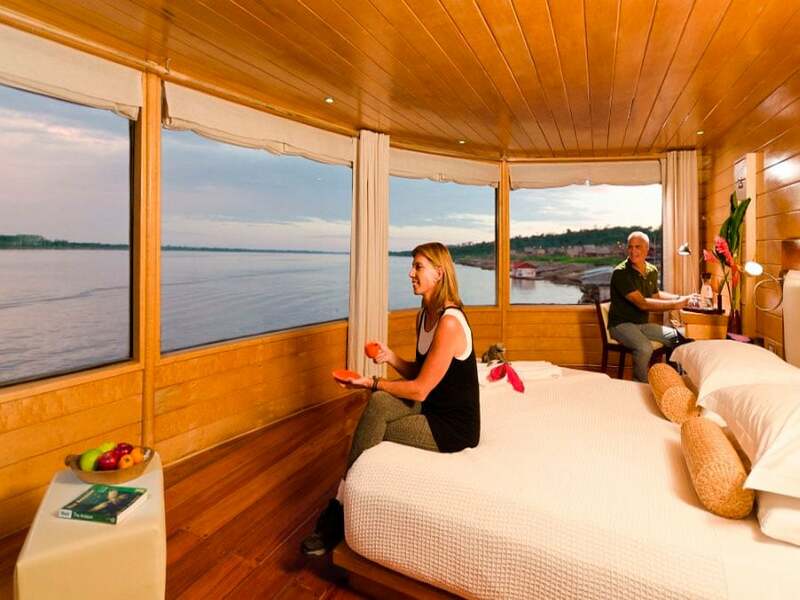 When on board, you can relax in the rooms and socialize or find some peace and quiet. The walls are decorated with local art work from Amazon communities, which is for sale. The purchase of these paintings goes to help local children fund their education. David and I had a wonderful time cruising down the Amazon. The food was amazing and the crew extraordinary. Loved the birds we added to our life list. The Delfin II provides four spacious master suites located at the front of the vessel, which are complete with king sizes beds, sheets and bedspread of 100% 280-thread Peruvian cotton, and 180° panoramic windows. We then provide all cotton towels and bathrobes, the finest organic amenities, the most wonderful view, and individual reading lights. Your suite will be the epitome of calming luxury and enjoyment. The Delfin II's 10 suites are fitted with extra large windows so you don't miss any of the fantastic views of the Pacaya Samiria Reserve. 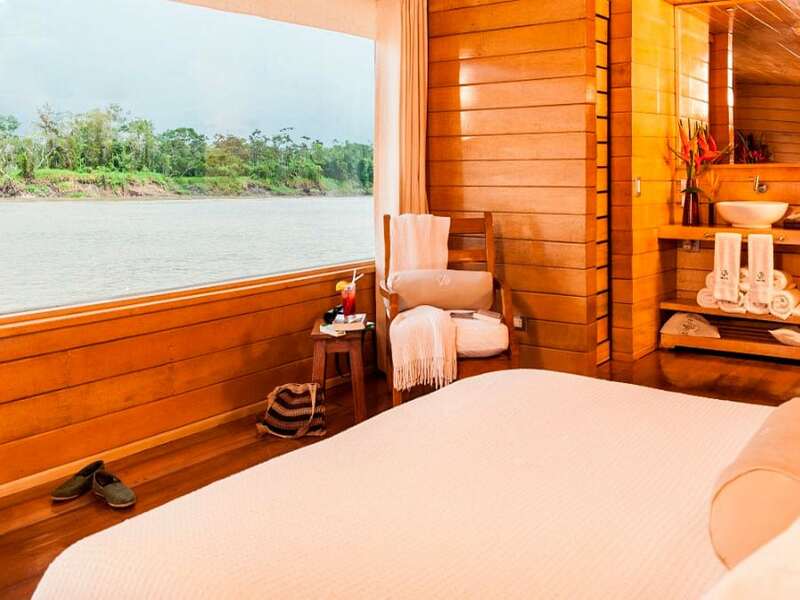 Enjoy laying on your very comfortable bed and gazing at the Amazon Rainforest, while relaxing in luxurious surroundings. The suites are equipped with luxury linens and your ensuite comes with organic shower and beauty creams so you can pamper yourself while on board. Beautiful boat, welcome arrival. Food was exquisite, all services world class. We congratulate the team and management. Exquisite!! Our aim is to provide you with the highest quality cuisine and service possible. You will return from exploring the wilderness and be greeted by glistening crystalware and fine china lit by glowing candlelight. 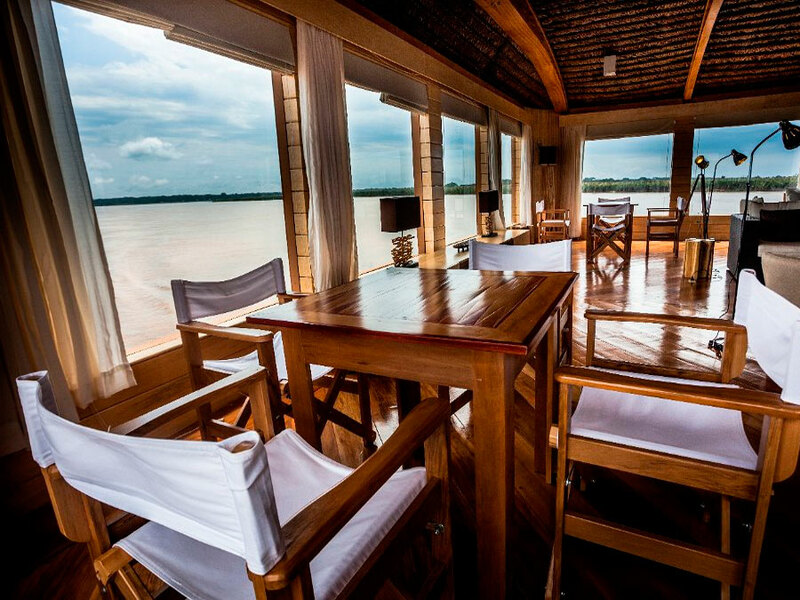 We can accommodate special dietary requirements (children, vegetarian, allergic) if mentioned 30 days before departure as we venture to remote areas of the rainforest. We offer private charters on the Delfin II for 5 or 7 days. Please contact us using the enquiry form for more information. Our trip was incredible and something we will remember for the rest of our lives! Thank you for creating such an amazing experience! 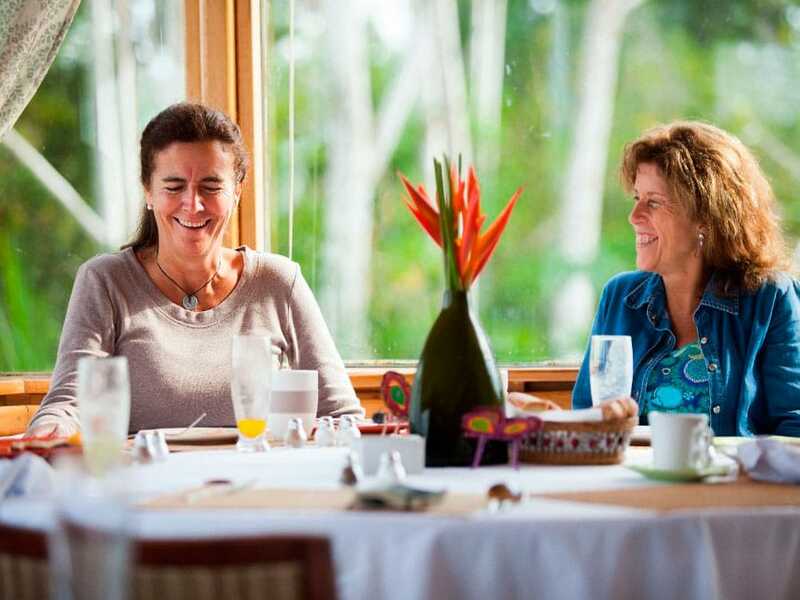 We pride ourselves on our Delfin experience and provide a wellness program for guests. 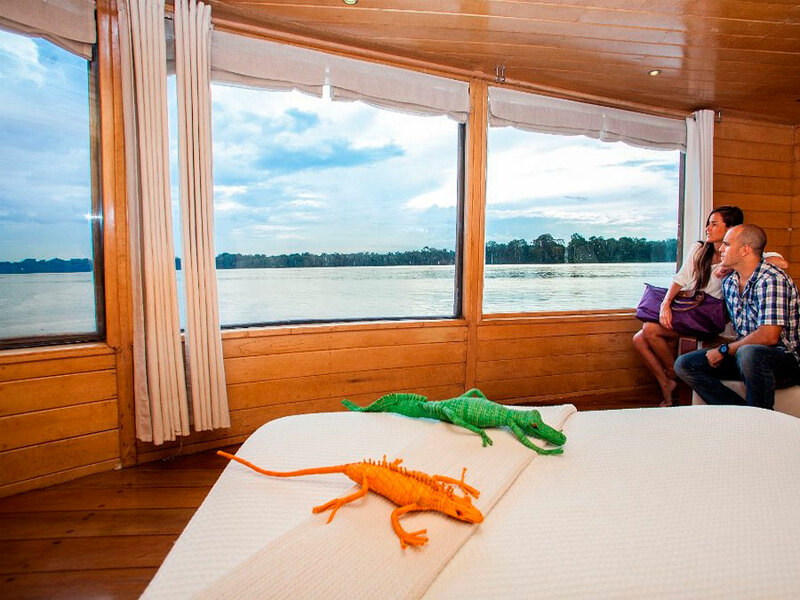 Our onboard wellness specialist will provide a customized massage so you can relax among the pristine surroundings of the Amazon Rainforest. We offer flexible wellness times, so you can schedule your massage around your expeditions in the convenience and privacy of your deck. 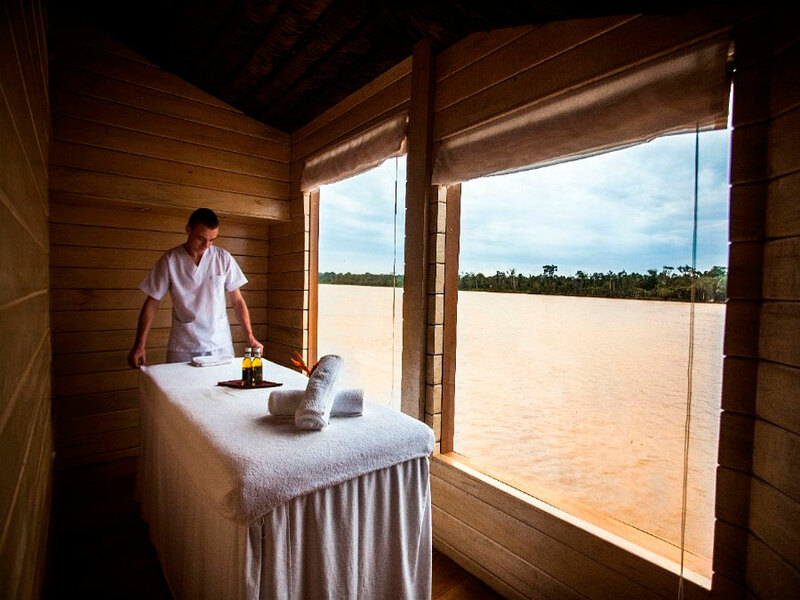 Our wellness specialist brings the healing traditions of the rainforest for your relaxation and will work in your body´s deep muscles; easing and soothing aches and pains. To arrange a wellness treatment, please make a booking form by the Bar in the third deck. Thank you to the passionate crew. We loved the friendly atmosphere and dedication to this environment. 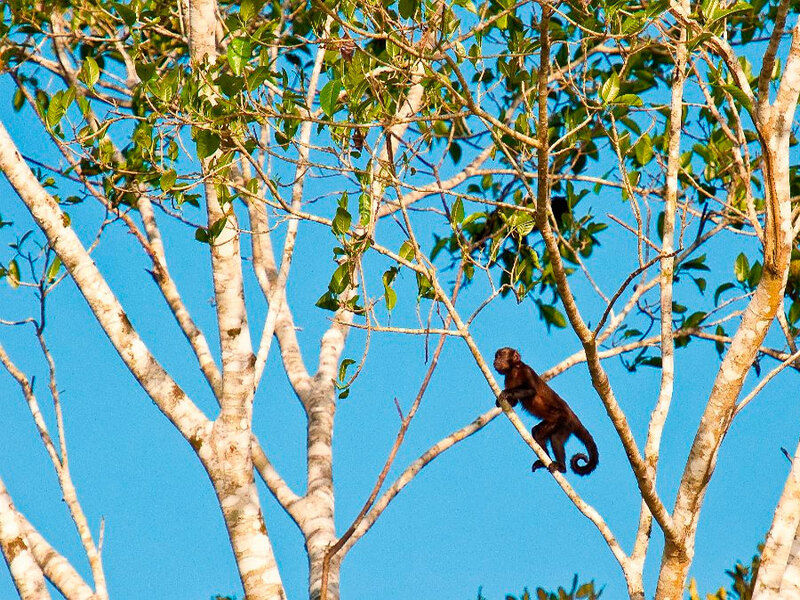 You can explore the western Amazon's highly diverse Pacaya Samiria National Reserve on our quick-launch skiffs, which seat 8 passengers and are led by a captain and naturalist guide. 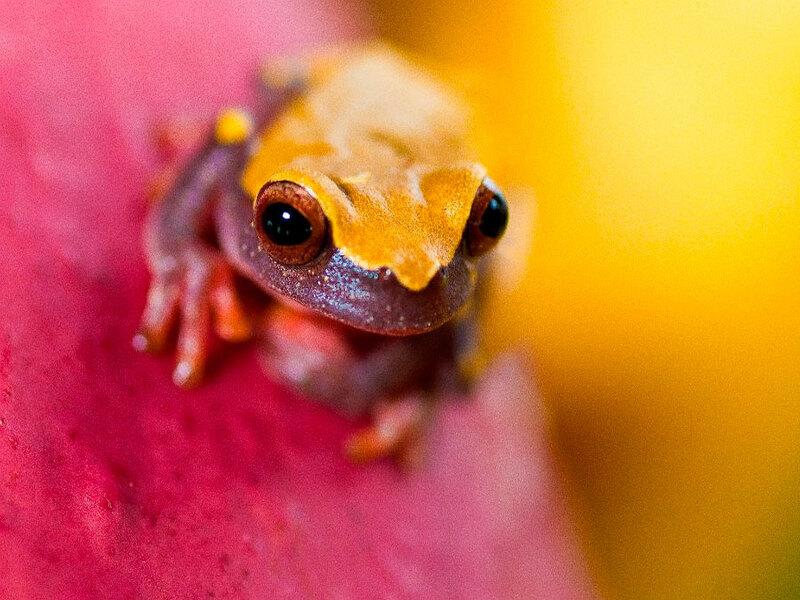 The western Amazon Rainforest, found in Peru, has been found to contain more diversity of animals and plants than other Amazon areas. In addition to the skiffs, you will also have access to our new Native 16” River Kayaks. These will give you more maneuverability down narrow tributaries, small creeks and lagoons so you can explore deeper rainforest life. 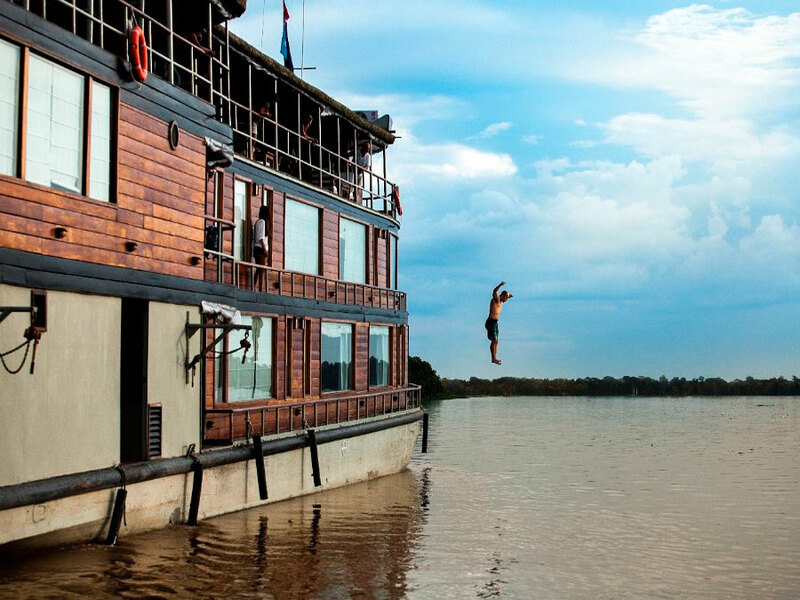 Here you will find peacock bass, gigantic awe-inspiring Amazon catfish and other exotic sporting species. If fishing, as part of our Environmental Commitment, we exercise a strict policy of catch and release. 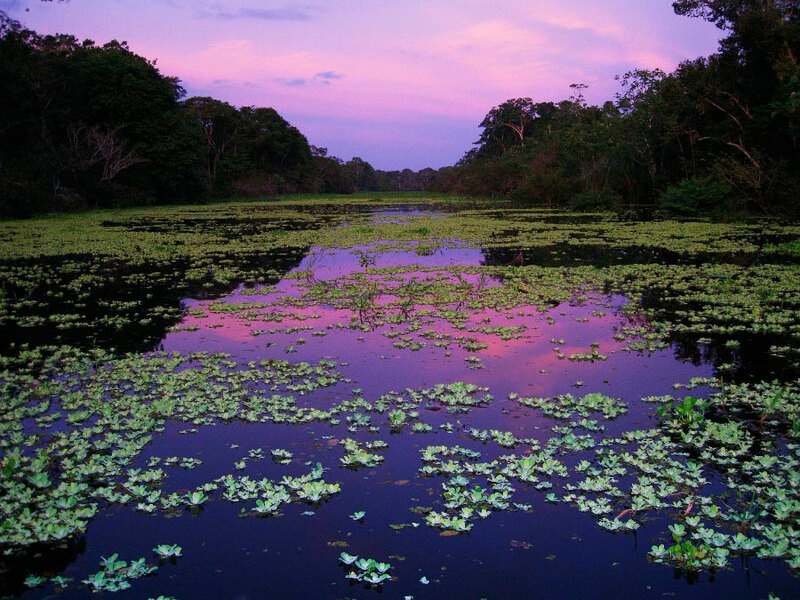 The largest flooded tropical forest in the world, the Pacaya Samiria National Reserve contains an impressive assortment of tropical wildlife. 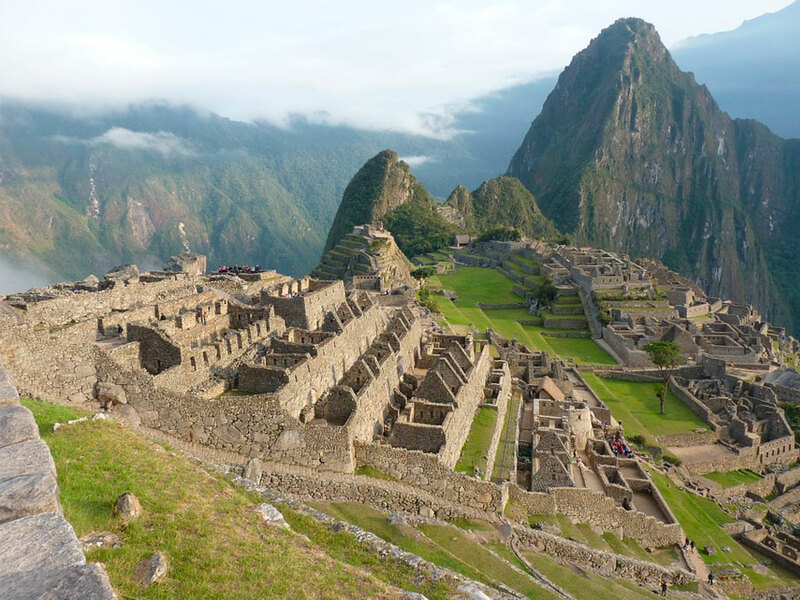 During the rainy season in the Andes, water levels rise in the Amazon, flooding 85% of the reserve and making it only accessible by boat. The people of the Pacaya Samiria reply on the reserve for terrestrial and aquatic resources for their food and income. On our Delfin II cruises, you will experience a mix of nature and cultural history learning about the local communities of the Pacaya Samiria National Reserve. We are working with the local communities to balance their needs from the forest with the future of the reserve and its wildlife. Single Supplement is + 50% in addition to the adult rate. Transfer to/from vessel when arriving on recommended flights to Iquitos (17:00 hrs). Air Tickets to and from Iquitos. 7 years old minimum on all departures. Children age 11 or under will receive a 20% discount. The package includes transfer from/to the Iquitos Airport to/from the port of Nauta, where the vessel will sail out from. This transfer is only for the recommended LAN flights, arriving and departing approximately at 5:00 pm. 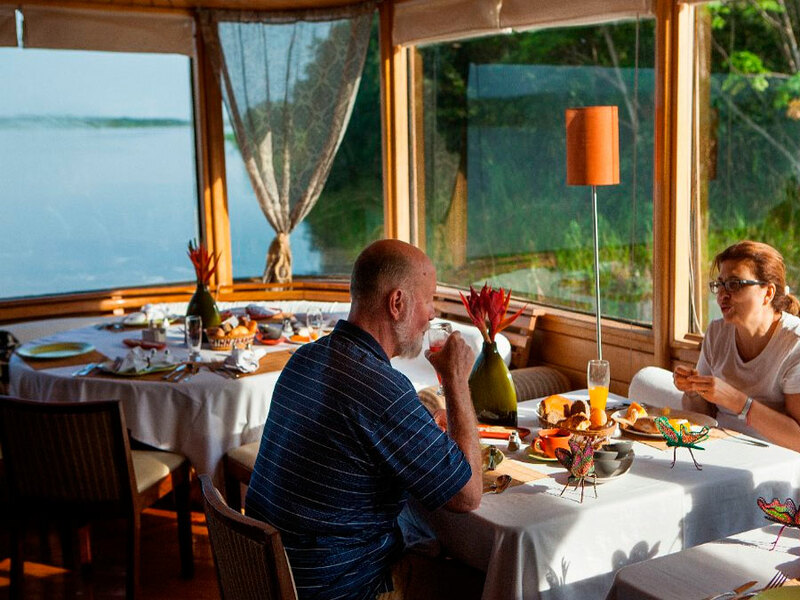 Supposing the passenger arrives earlier, and needs to be taken to Iquitos, have a city tour, or taken to a restaurant. Supposing the passenger arrives later, and needs private transportation to the port of Nauta and then a private boat to catch the vessel. Select your adventure date using the calendar below to book this adventure. Please select number of adults and children checking into the adventure using the controls you see below. The summary of your adventure booking is shown below.